On October 11 Microsoft unveiled a first look at Dynamics 365, the next generation of intelligent, purpose-built business applications that work seamlessly together to help manage specific business functions across Sales, Customer Service, Operations, Financials, and beyond. PowerApps, Microsoft Flow, and the Common Data Service are built-in to make Dynamics 365 easily adaptable to the specific needs of any organization. For business users, Dynamics 365 unifies the experience of navigating a wide range of business applications — not only the solutions offered by Microsoft, but also those of our partners as well as custom business applications developed with PowerApps. 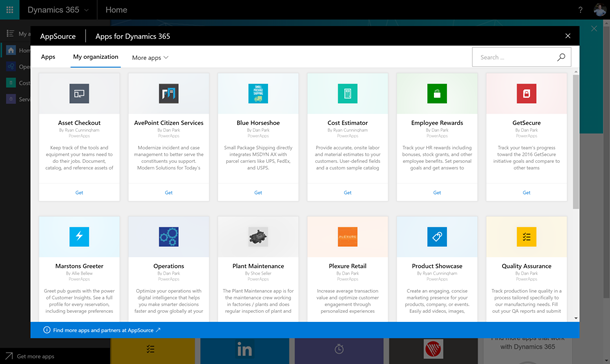 Users now have a single starting point at home.dynamics.com to find and launch any business app regardless of where it came from. There is also now a single unified navigation framework across these apps, giving users an efficient and familiar way to move across apps without distraction. And Microsoft AppSource is embedded at every turn, making it easy to find new apps both from inside an organization as well as from hundreds of Microsoft partners. What does Dynamics 365 mean for users of PowerApps? 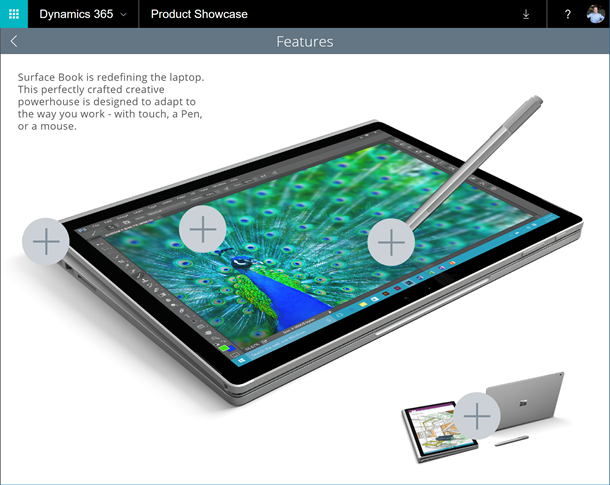 The new home page at home.dynamics.com is a launch pad for business users. It displays all of your apps — the apps you’ve specifically chosen to use (e.g., by launching from a share email or opening from AppSource) or an admin has provisioned for you. This includes all of your PowerApps, as well as Dynamics 365 applications from Microsoft. You can search for apps, filter by environment, and pin the apps you use most frequently to the top of the page. 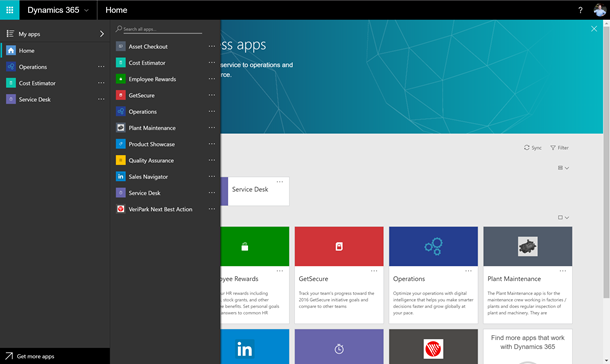 Microsoft AppSource is now embedded in the Dynamics 365 home page and throughout the common navigation, and now includes a private gallery of apps available to you within your company. 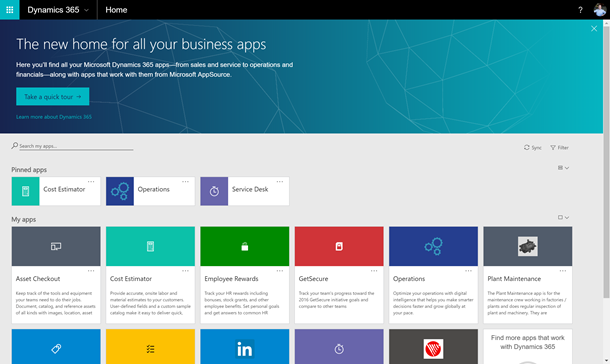 Select “Get more apps” from the home page or task pane, and navigate to the “My Organization” tab to see apps made available to you. Apps built with PowerApps and shared with a security group or the entire company will be found here and will not clutter a user’s home page by default. Once users choose to “get” an app from AppSource, it will then appear on the home page and be easily accessible throughout the experience. As you launch apps on the web, you’ll notice that the main header navigation maintains a consistent experience and format. You’ll always have your Dynamics 365 applications just a click away via the task pane, and your Office applications like Outlook and OneDrive are close at hand as well. The name of your app will display prominently in the header. The Dynamics 365 common header includes a task pane — a quick way to navigate between apps without having to return to home.dynamics.com. In fact, all of the apps that appear on your home page will be accessible from within the task pane while using any other app. The top level of the task pane contains apps you’ve pinned for quick access and shows the currently-running app so you can easily pin it if you’d like, just like a Windows task bar for your web-based business applications. You can browse, search, and pin the rest of your apps from the My Apps section of the task pane, and find additional apps via AppSource by selecting Get More Apps at the bottom of the main pane. With the introduction of Dynamics 365 as a place for business users to find and launch apps, web.powerapps.com will now focus directly on the needs of app creators. This is where makers can create and publish apps, work with the Common Data Service and manage connections and gateways. You’ll also notice new tutorials, sample apps, and other tools for getting started quickly. To learn more about how to use web.powerapps.com to share apps with users for discovery in AppSource and Dynamics 365, check out this blog post. Read more about finding and using PowerApps on the web, and give home.dynamics.com a spin today!